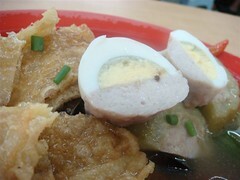 We stumbled upon a place where one can get rather good Yong Tau Foo, in the Pandan Indah area of town. 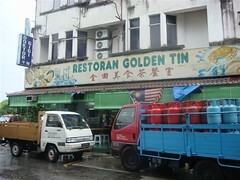 Golden Tin is not a new coffee-shop, but it is new to us because if we head out to that part of town, it’s normally Thai food that we are looking for. 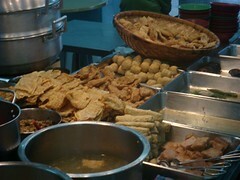 At Rmo.80 per piece of YTF, the portions are big, and the vegetables are crisp and the deep fried items just crumble, crunch and flake in your mouth. The novelty here is hard-boiled golden eggs stuffed with YTF stuffings… nice! 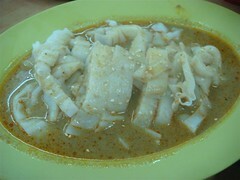 The Chee Cheong Fun (flat white noodle) with curry sauce however is pretty average, so our advice is to save your stomach for just the Yong tau foo.. don’t bother with the noodles. Another exotic “find” … well done!! ps – I am recuperating my tummy and liver post-CNY!! 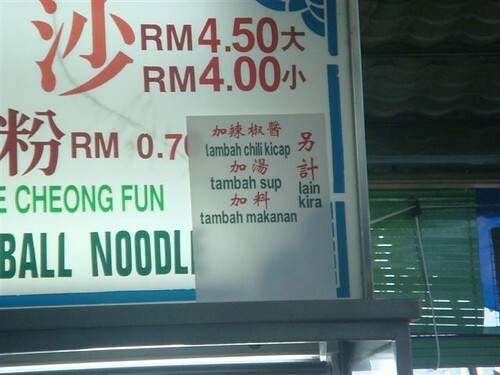 Well, I’m sure that the boss had been asked a lot to “tambah” his special chilly sauce that makes the yong tau fu so darn tasty. You’ll be amazed that some people actually lick the plate till the last drop.. lol! Pandan Indah is quite far from my home.. so I will only go there if I happen to be in that area. Is this restaurant nearby to the Thai Market Front/Baan Nook? yup, it is near Baan Nok .. read more about that Thai Market Font here! YTF is my favourite health food 🙂 Now I wonder how they glued the fish paste onto the egg esp. the crumbly yoke. and they dont tell the price of the additional chilli sauce hor? the owner is strange alright..lol! oh, looks like pandan indah has got lots to offer. now that we’ve been to ban nook, it’s time to explore the others! You da man lar! I need to explore Pandan Indah more. Btw, I love that last sign…so cute!